Summary: Immune system protein could play a role in the development of schizophrenia and epilepsy during pregnancy, researchers report. Researchers say a protein usually associated with the immune system could play a role in the development of neurological conditions such as epilepsy and schizophrenia. University of Queensland lecturer and medical alumnus Dr Liam Coulthard led the study into how brain development is affected by altering the activity of the complement system – which controls innate or natural immunity – during pregnancy. “Our research in mouse models has shown neural defects can result when this system is functioning inappropriately in utero,” Dr Coulthard said. “We blocked a key complement component, called C5a, for three days during pregnancy, and this resulted in behavioural abnormalities in the offspring. The research was part of Dr Coulthard’s thesis for his PhD, supervised by Associate Professor Trent Woodruff, who heads the Neuroinflammation Laboratory at the UQ School of Biomedical Sciences. Dr Woodruff’s lab works on potent inflammatory molecules in the immune system, including C5a. Red: Tight junction marker (Zo-1) demonstrating the apical surface. Green: Cytoskeleton marker (TUBB-3) showing the radial structure of the rosettes. Blue: Nucleus of cells (DAPI). NeuroscienceNews.com image is adapted from the University of Queensland news release. The study showed the protein occurs in significant amounts in brain regions during development in utero, prior to the immune system being developed. 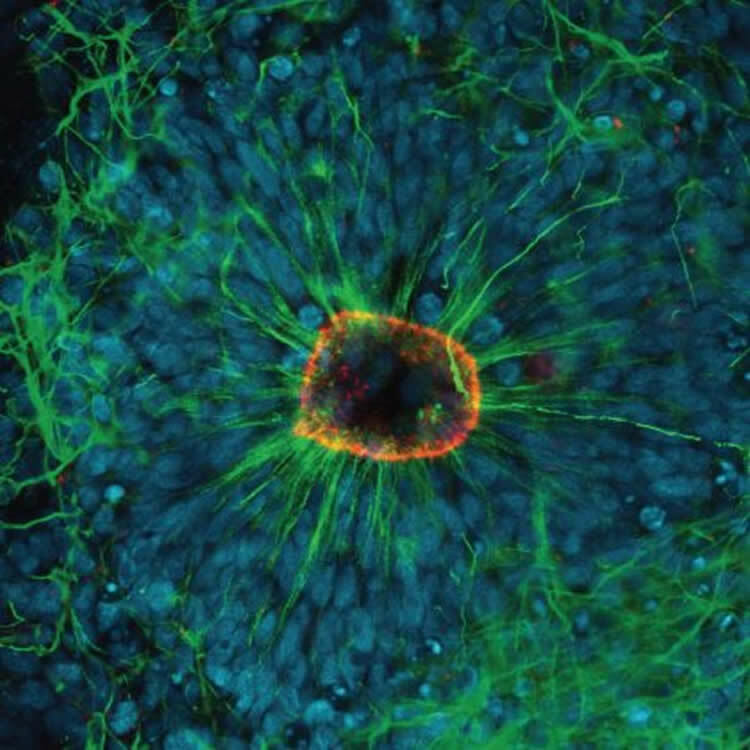 This complement system was also activated in a human model of brain development using induced pluripotent stem cells, in work done in collaboration with Professor Ernst Wolvetang from UQ’s Australian Institute for Bioengineering and Nanotechnology. C5a has been linked to inflammation pathways in neurodegenerative conditions such as motor neuron disease, and the lab is working towards the development of new drugs to block disease progression. “Our findings confirm that drugs inhibiting this system could pose a risk in pregnancy and could prompt recommendations they not be given to women of child-bearing age,” Dr Coulthard said. Dr Coulthard is a Resident Medical Officer at the Royal Brisbane and Women’s Hospital. Image Source: NeuroscienceNews.com image is adapted from the University of Queensland news release. University of Queensland “Neurological Conditions May Begin In the Womb.” NeuroscienceNews. NeuroscienceNews, 19 May 2017. University of Queensland “Neurological Conditions May Begin In the Womb.” http://neurosciencenews.com/invitro-neurology-immunity-6734/ (accessed May 19, 2017). The complement system, typically associated with innate immunity, is emerging as a key controller of non-immune systems including in development, with recent studies linking complement mutations with neurodevelopmental disease. A key effector of the complement response is the activation fragment C5a which, through its receptor C5aR1, is a potent driver of inflammation. Surprisingly, C5aR1 is also expressed during early mammalian embryogenesis, however no clearly defined function is ascribed to C5aR1 in development. Here we demonstrate polarized expression of C5aR1 on the apical surface of mouse embryonic neural progenitor cells in vivo, and on human embryonic stem cell derived neural progenitors. We further show that signaling of endogenous C5a during mouse embryogenesis drives proliferation of neural progenitor cells within the ventricular zone, and was required for normal brain histogenesis. C5aR1 signaling in neural progenitors was dependent on atypical protein kinase C zeta (PKCζ), a mediator of stem cell polarity, with C5aR1 inhibition reducing proliferation and symmetric division of apical neural progenitors in human and mouse models. C5aR1 signaling was shown to promote the maintenance of cell polarity, with exogenous C5a increasing the retention of polarized rosette architecture in human neural progenitors following physical or chemical disruption. Transient inhibition of C5aR1 during neurogenesis in developing mice led to behavioral abnormalities in both sexes and MRI-detected brain microstructural alterations, in studied males, demonstrating a requirement of C5aR1 signaling for appropriate brain development. This study thus identifies a functional role for C5a-C5aR1 signaling in mammalian neurogenesis, and provides mechanistic insight into recently identified complement gene mutations and brain disorders. The complement system, traditionally known as a controller of innate immunity, now stands as a multi-faceted signaling family with a broad range of physiological actions. These include roles in the brain, where complement activation is associated with diseases including epilepsy and schizophrenia. This study has explored complement regulation of neurogenesis, identifying a novel relationship between the complement activation peptide C5a, and the neural progenitor proliferation underpinning formation of the mammalian brain. C5a was identified as a regulator of cell polarity, with inhibition of C5a receptors during embryogenesis leading to abnormal brain development and behavioral deficits. This work demonstrates mechanisms through which dysregulation of complement causes developmental disease, and highlights the potential risk of complement inhibition for therapeutic purposes in pregnancy.